PE pipe offers many cost saving advantages in both above ground and below ground installations. Whilst they are robust and resistant to site damage, normal care, sensible handling practices are necessary to ensure trouble free operations. 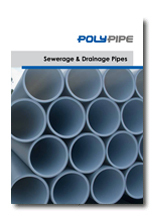 PE pipe should be handled, stored and installed in accordance with Australian Standard AS/NZS 2033:2008 - Installation of polyethylene pipe systems. Local Authority Regulations and specifications should also be adhered to.